The UCITS product has been hugely successful since its inception in 1985. Over the last 30 years, UCITS have gone from strength to strength, with 31,974 UCITS funds with €9,714 billion in assets as of 31 December 2017, according to EFAMA. Europe is the most popular market for distributing UCITS funds, with over (86,000) registrations at the end of December 2016. This is over 10 times more than the next highest investing region, the Asia Pacific region, followed by the Americas and then the Middle East / Africa region. Europe is therefore a market that should not be ignored by asset managers looking to raise assets. Many European investors look for the protection of the UCITS framework when making investments. 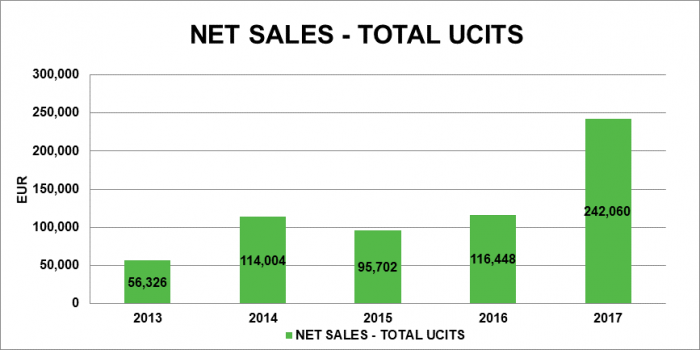 Net sales in 2017 were the highest record and were more than the previous high in 2016. 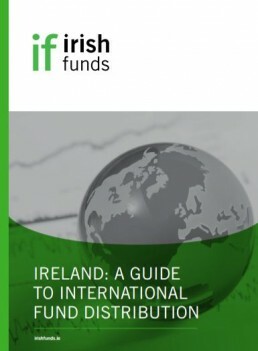 The UCITS Passport – How does it work? UCITS funds benefit from a European Economic Area (EEA) wide “passport” which means that once they are authorised in one EEA member state, they can be sold in any other EEA member state without the need for any additional authorisation. This is called the notification procedure. The home state regulator has 10 working days from the receipt of the notification file to notify the host state regulator. The host state regulator has at most 5 working days to confirm to the home state regulator that the notification file has been received and the documents are printable and readable. 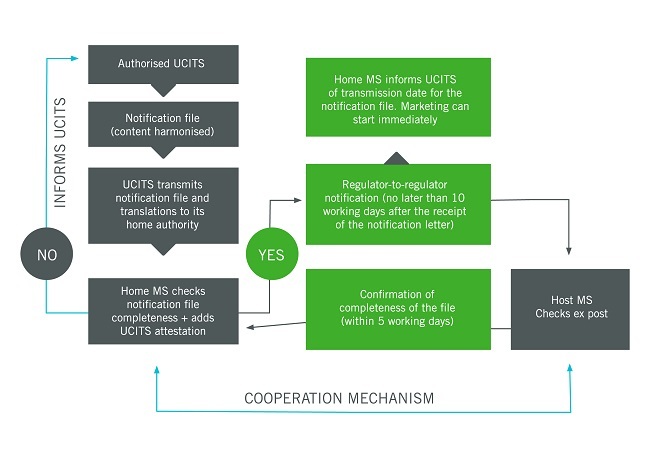 Type/name of the entity in charge of the marketing of UCITS in the particular country. Details of the paying agent where applicable. Details of any person from whom investors may obtain information and documents. Name and place of the entity where the investors may obtain the net asset values, issue and redemption prices, the last prospectus, the last financial reports, the fund rules/ articles of incorporation and as far as enabled, access to the contracts arranged with the UCITS. Any other information required by the host regulator in terms of details of any information disclosed to unit holder or their agents. Details of the use of any exemptions that are available in a country in relation to marketing arrangements. Some countries may require additional documentation in the form of a prospectus supplement or may have specific service provider requirements, such as a local representative and/ or a paying agent. The procedure for selling UCITS funds outside of the EEA is country specific and would need to be considered on a country by country basis. Laura Wadding, Deloitte, talks about what to do to prepare for MiFID II implementation with regards to UCITS distribution, focusing on getting the suitability criteria of the fund into the prospectus.